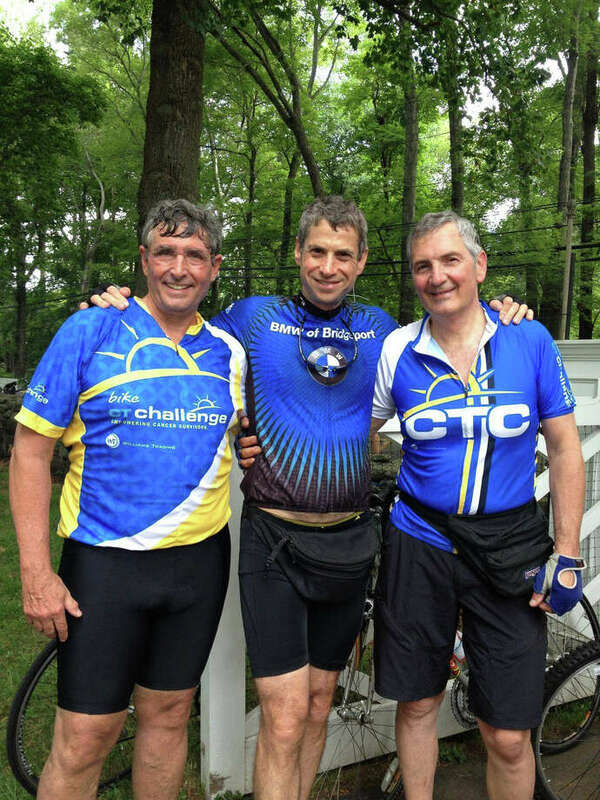 Three physicians from Coastal Orthopaedics, which has offices in New Canaan and Darien, rode in the CT Challenge July 25 and 26. From left, Jeffrey V. DeLuca, Jay Kleeman and Nicholas Polifroni. Eight team members from Coastal Orthopaedics, of New Canaan and Darien, participated in the CT Challenge bike ride July 25 and 26 and raised $20,640 for the nonprofit organization. Physicians Jeffrey V. DeLuca, T. Jay Kleeman and Nicholas Poliforni rode 25 miles each, and four other team members rode 10 miles. The other team members were Paul Protomastro, Donna Frydrych, Steve Frydrych, Doris Haniquet and Jacquelyn Spezzano. The team set a goal of $15,000, and will be collecting donations for another 56 days. Kleeman earned the most for the team and is in fifth place overall for money raised for the charity, according to a news release from the firm. The annual event helps raise funds for cancer survivors for special programs and research in exercise, nutrition and psychosocial support.